We were able to get the owner of this nugget an acceptable offer in only 6 days. In 6 days we received 3 solid offers on the nugget, then we negotiated on the sellers behalf to arrange a deal that was favorable to both seller and buyer. We then handled all the details of the nugget sale, providing a safe and secure transaction for both the seller and buyer. I want to express my appreciation and total satisfaction with the efforts of Garry and Janet Bishop for marketing and handling all sales aspects for my 41 ounce gold nugget through their goldnuggetsales.com website. I had this nugget listed on another gold website for over a year with no offers prior to finding goldnuggetsales.com. I mentioned the nugget to Garry on January 10th, 2012 and he asked me about it and we started discussing what he could do to give the nugget more exposure. On January 11th, we discussed details of putting the nugget up on Garry's website and created a simple contract that we were both happy with. The contract was signed on January 18th and Garry put photos of the nugget and a detailed write up about it on his website on January 21st. Garry did other marketing as well to create maximum exposure for the nugget. We received the first legitimate offer on January 23rd. On January 23rd, Janet found a lawyer near the Dallas airport who could handle an escrow for the transaction. The first offer was low, so Garry worked with the buyer to raise the offer. We received an updated offer from the first buyer on January 24th and received a second offer from another buyer on January 25th. We then received a third offer but that buyer did not respond to our counter offer. On January 27th, we received an acceptable offer and started the escrow process. Garry and Janet kept me up-to-date on the progress of setting up the escrow and made arrangements for the buyer and I to come to Dallas to close the sale on February 8th. We all met at the escrow office on the 8th and went over the closing papers. The buyer was very happy with his purchase and I was very happy with how the whole process went. I cannot stress enough how efficiently and professionally Garry and Janet were throughout the process. The kept me informed every step of the way and made sure that all details were taken care of. If you are considering selling a large nugget, I very highly recommend that you contact Garry. I believe that you will be very satisfied with the results. It was a great pleasure to work with Garry and Janet. They really went above and beyond and everyone was happy with the results. We wish to personally thank you for providing us with the opportunity to acquire a once in a lifetime gold nugget. The 41oz 'Fantail' is truly beautiful and stunning to say the least! It was a joy to meet with you and the former owner in person and thank you both for providing not only the gold nugget, but also the wonderful history accompanying it. Another thank you for organizing everything from the exchange to personal transportation. It was very much appreciated. Wow! 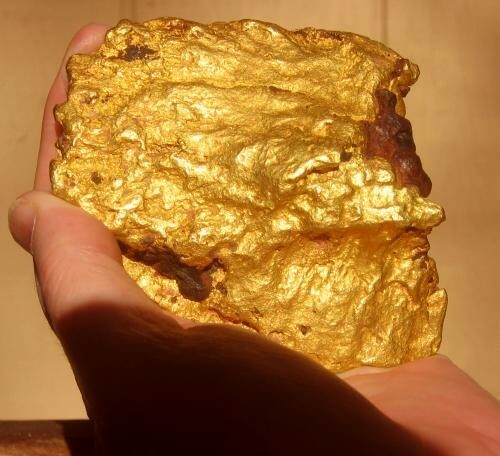 How often do you see an Australian Gold Nugget this big? Never for most of us. And to find one this size that is for sale at a reasonable price is even more rare. 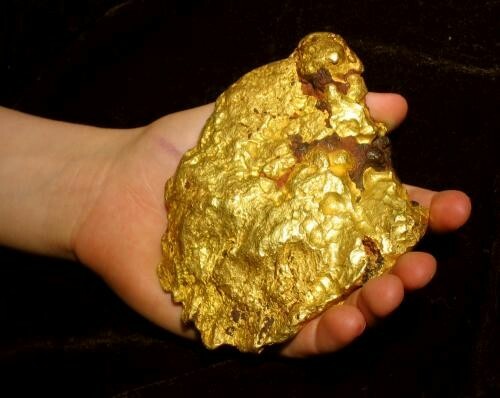 There are less than 400 gold nuggets weighing over 40 ounces in the world, which means this is a very rare gold nugget. Any museum in the world would be delighted and lucky to have a gold nugget like this one on display. This is a rare opportunity for you to add an exceptionally rare gold nugget to your collection. This gold nugget would be the focal point of any gold nugget collection. Also because of rising gold prices and the extreme rarity of this nugget, it is a great investment. 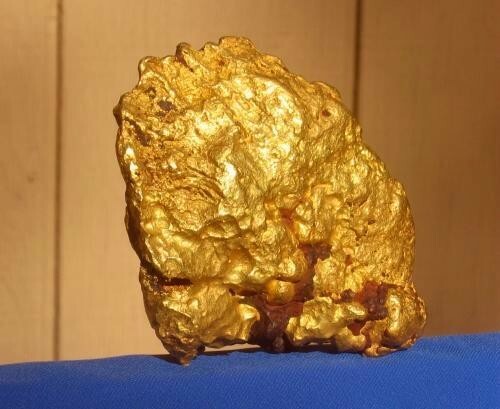 This extraordinary gold nugget weighs 40.98 Troy Ounces (1274 Grams). It is 3.5 " (9 cm) long x 3.25" (8.3 cm) wide x 1.0" (2.5 cm) thick. This nugget is huge by any measure. Because of it's unique characteristics, years ago it was named the "Fantail". It stands on it's own on 3 points at the bottom as you can see in the first 2 photos, so it is very convenient to display. The nugget was found in 1998 during a prospecting expedition in the Red Castle Mining District in Australia, about 250 km northeast of Kalgoorlie. It was on display at the Perth Mint for 6 months after it was found.